Could Zetas tell us is there a possibility that severity of the upcoming earth changes and the pole shift previously predicted will be greatly lessened or even averted? This is not a wishful thinking, I'm just contemplating about other options. 7/10 events have been held back for around two years now, and as Zetas said, all the steps will happen with less severity. Until now, except strange weather and a lot of local incidents, nothing yet has happened on a large scale with great devastation or mass casualties. As I understand, after the announcement which will probably happen soon, the 7/10 sequence should continue. May we find out what will happen after the announcement? What will happen in case that the announcement doesn't happen? We have repeatedly stated that the coming Pole Shift is a natural event, and as such the Council of Worlds will not interfere with it. Man’s school house is designed to challenge man, so that spiritual lessons may proceed. Do benign aliens prevent tornados from shredding towns, floods from drowning those in its path, or prevent lightning from a sudden and unexpected strike? The Rule of Non-Interference states that things, not people, can be adjusted if the Council of Worlds determines that a balance is needed. In that each incident must be approved, this occurs seldom. Such an adjustment occurred to delay the 7 of 10 plate movements so that the populace would understand what is pending and not die before being able to act. Will there be additional such rulings? The Council of Worlds is more inclined to allow interference with the things that have been built by man, such as nuclear bombs or nuclear power stations. Man built it, and The Call given by man can be allowed to change the situation, allowing man to disable what he built, in effect. This does not apply to natural events! To help those confused to gain perspective on this matter, we point to the quarantine of the Annunaki from Earth, so that mankind would have a more balanced perspective during their spiritual growth. In this, the Council adjusted things, to influence the Annunaki, and did not merely physically remove them from Earth. What we are stating is that of this day, at this time, the Council has not indicated plans to interfere with the coming Pole Shift beyond what we have already detailed. The 7 of 10 plate movements, including those that would have caused the horrific European tsunami, have been modulated to allow mankind to understand what is coming before these Earth changes strike. This Council decision was influenced in great part by Obama’s decision to inform mankind, else the 7 of 10 would have been allowed to play out without interference. The 8 of 10 Earth effects, which include a more severe Earth wobble and greater visibility of the Planet X complex, have been allowed to unfold on schedule. Given the difference of opinion between STO groups like the Zetas and Pleiadeans regarding the Pole Shift, how is it determined who responds to an STO call on that subject, and will that not create problems after the Nibiru announcement between people who think preparation is essential and those told not to worry? It seems this will be a bigger issue as well, if the official govt "experts" are also telling people it will not be as bad as Zetan predictions. The populace gets their information about the coming Pole Shift from many sources. One is what the establishment chooses to tell them, which will migrate from an absolute denial that Nibiru, aka Planet X, even exists to a denial that the Pole Shift will be devastating to the Earth. Both are lies. This issue will be debated, as we have explained, with our version of the Pole Shift presented by Nancy and the ZetaTalk website and the establishment version presented by notaries such as Neil de Grasse Tyson. As the Earth changes continue to unfold in step with our predictions, the populace will increasingly take our version seriously. A second source of information on the coming Pole Shift is afforded to contactees, who are increasing by great numbers the past couple years due to anxiety about the Earth changes. It is not just the erratic weather, it’s the Sun and Moon out of place, the constellations not appropriate for the seasons, and all of this ignored by the media. We have mentioned that the Pleiadeans are considered greeters, often the first to respond to a new Call because their appearance is similar to humans and their message gentle. The response to the Call is categorized, so when a new contactee is not satisfied being told that nothing scary will happen in the future, they are transferred to ourselves or other groups who are honest about what is coming. Mass hysteria occurs where there is a combination of a stressful situation combined with social pressure not to react to the situation. There have been horrific fires among garment workers in Bangladesh recently. Being burned alive is extremely painful, for the short time the person is conscious, and this is well known. Who has not been burned at one point or another in their life, if only from a flying spark? The human instinct, as with any animal, is to flee, but the Bangladesh workers are told to remain calm and return to their jobs. Due to poverty they have no choice but to do so. The extreme anxiety they feel finds an outlet, which allows them to leave the workplace, if only temporarily. In Afghanistan and Pakistan the Taliban are violently opposed to woman and girls becoming educated. A much publicized case involved a young girl, an activist, being shot in the neck, barely surviving, as she rode on the school bus. She survived (with the help of benign aliens) and was taken to the UK for treatment. How are young girls attending school then in Afghanistan to feel? At ease? Their animal instincts are to flee, but their desire to learn and become educated pushes them forward. They are encouraged by their parents and by society to attend school. Becoming sick gives them an out, in this conflict, so they can return home, if only temporarily. In Japan children are under extreme pressure to achieve. The suicide rate is high among children, and adults die from stress, as is documented. In Japan, there is nowhere for a young girl to go, to escape the pressure which affects all society there. Hyperventilating is a reaction to stress, and indeed can cause one to faint. Will mass hysteria increase as the Earth changes increase? As long as the establishment attempts to keep the populace in their jobs and in their coastal homes, rather than moving to safety, this will certainly be on the rise. Just like with the release of Deep Impact and Armageddon in the same summer, Hollywood has released two movies with the same basic plot; terrorists take over the White House, nearly cripple the USA, but all is saved at the last moment. The first movie was called Olympus Has Fallen and came out in March; the second, White House Down, came out just days ago; it was originally supposed to be released in November but was pushed to late June. White House Down is also directed by Ronald Emmerich who made the establishment picture Independence Day. My question is, does this pattern again mean that the establishment wants an image in the public mind, perhaps of a weak White House and military might? And does this change in release date have anything to do with the pending announcement as studios usually push their blockbusters during these months and it was not expected to be such a movie? [and from another] http://www.fandango.com/whitehousedown_156653/moviereviews The movie has a political agenda. This happens a lot. Hollywood is always so predicable in casting the Republicans as the villains and the Dems as the heroes. The guys who take the White House include a right winger and a white supremacist, because according the Hollywood those are kind of the same thing. At the end, the Republican politician turns out to be the villainous mastermind who did all this evil to be president and help his buddies in the defense industry. A right wing extremist,, a white supremacist and the GOP Speaker of the House all in cahoots to cause murder and mayhem. Classic Hollywood smearing of Republicans. Almost comical. If you don't care about the politicking or if you are liberal, this is enjoyable, but if you hate being told that one party is inherently good and benevolent and the other is inherently wicked and evil, you'll want to skip it. [and from another] http://www.rottentomatoes.com/m/olympus_has_fallen_2013/ When the White House (Secret Service Code: "Olympus") is captured by a terrorist mastermind and the President is kidnapped, disgraced former Presidential guard Mike Banning finds himself trapped within the building. As our national security team scrambles to respond, they are forced to rely on Banning's inside knowledge to help retake the White House, save the President and avert an even bigger crisis. 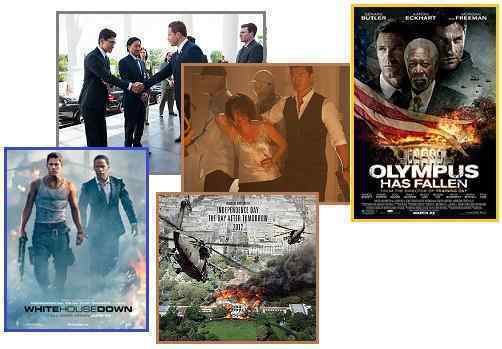 It is just coincidence that Obama has had to dodge several assassination attempts this Spring, at a time when the release of two different movies with a White House Down theme occurred? This would almost seem to be a case of “Life Imitates Art”. The real-life plots preceded the Hollywood release, but the mindset of Obama’s enemies was no secret when the scripts were written. The loss of the 2012 election was a bitter pill for the Republicans. Taking Obama out, under whatever ruse, is frequently muttered in some circles. All this preceded Obama’s decision to admit the presence of Nibiru, aka Planet X, which only aggravated those intent upon seeing a change in the White House. Box office profits are often dependent upon what the public subconsciously senses is a real-life agenda. Thus the focus on a vulnerable White House being the target of the military-industrial complex, Israeli sympathizers, and NAZIs. Another Russian rocket with a payload of "navigation satellites" blew up seconds after launch - again. Would our friends care to comment? Were they really navigation satellites? Or was the payload something else and did our benevolent friends have anything to do with it? 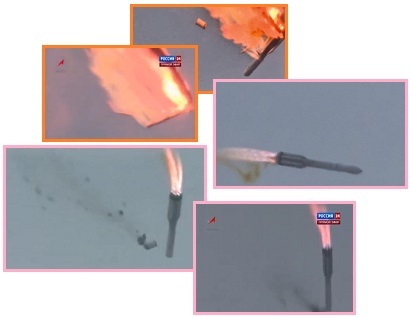 [and from another] Unmanned Russian rocket explodes seconds after liftoff http://www.cnn.com/2013/07/02/world/europe/russia-rocket-explosion/?hpt=hp_t2 An unmanned Russian rocket veered off course and exploded in a fireball Tuesday, seconds after liftoff from a launch pad in Kazakhstan. There were no immediate reports of casualties. The Proton-M rocket was carrying three satellites for Russia's Global Navigation Satellite System, or Glonass. Glonass is the Russian equivalent to the United States' Global Positioning System, or GPS. The rocket had just taken off from the Baikonur space center, in a launch broadcast live on television. Seconds later, it changed course, burst into flames and dove nose-first into the ground. In 2010, another Proton-M rocket carrying three satellites crashed in the Pacific Ocean. Authorities have suspended further launches of the rockets as they investigate what caused the explosion. This is not the first time that Russian satellites have been disabled upon launch, an obvious warning to the Russian establishment to cease and desist. Their stated intentions do not reflect their real intentions, which are to spy on drowning migrants heading toward Russian territory in the future. The Russians are not clumsy, but in fact technological wizards, having launched Sputnik ahead of the US in the race to space. They currently supply the ISS with their shuttles. Why would such a dramatic failure occur, when merely launching communication satellites? It was a message! During the severe flooding that will occur during the Last Weeks and Pole Shift, bombing those desperate to escape is a misuse of authority. This item hit the Internet in September 2012, but I have seen no discussion of it on Zeta Talk and want to ask the Zetas if it really happened and how it might improve the world. Allegedly, U.S. military troops in Afghanistan found something inside of a cave that is being called a "Vimana" (ancient anti-gravity flying machine described in Sanskrit texts) and that leaders of several Western governments were flown courtesy of the U.S. to a base in Afghanistan to be personally briefed on the situation. The video states that the Vimana is trapped in some sort of a “gravity well”, which has caused the death/disappearance of eight U.S. personnel who were involved in attempting to remove it from the cave. The video is “Secret 5000 Year Old Flying Machine Discovery with Steve Quayle” at http://www.youtube.com/watch?v=qBlwhVyZxmQ. My questions: Did this discovery actually take place, and if so, then what is the current status of the machine(s) found in the cave; for instance, is it still in the cave or were they able to remove it? What type of machine was found; please describe what it was? Will this new technology be kept tightly controlled by the military industrial complex or will it be shared with the world? Lastly, with the Pole Shift so close at hand, will its discovery make any sort of difference in the lives of ordinary people before the Pole Shift happens – since mankind is expected to be knocked-back 100+ years in technological capability – or will it be a technology that does not come into its own until many decades after the Pole Shift? Mankind is not equipped with the intelligence to manipulate gravity as we, the visitors, do. Gravity is used for faster-than-light travel and for density shifting, among other things. On occasion, ships used by the Service-to-Self malfunction, as the Service-to-Self are not into teamwork and thus make mistakes. Were it not for the Element of Doubt rule established by the Council of Worlds to guide mankind’s awakening, such crashed ships would be left today as litter on the landscape, as they were in the past. The Shaitan Mazar UFO crash in Russia was one such incident, in 1991, which was cleaned up, but only after it sickened the Russian teams sent to inspect the remote crash site. MJ12 was also loaned ships by those in the Service-to-Self, which the US military never were able to reverse engineer as they had hoped. A reputed case where MJ12 generals directed scientists to open the gravity mechanism resulted in many deaths, an explosion, a rumor that is true. Mankind cannot learn how to control gravity for space flight, as death will result via many routes if inspection of the mechanism is tried. That said, what will any Heads of State inspecting the abandoned ship in Afghanistan do with this discovery? It will be buried in place, with all records of where it exists expunged, as it cannot be moved or touched, as with the US exiting Afghanistan it cannot be a guarded location in the future.